BANGI, 9 August 2010 – Researchers from the Faculty of Technology and Infromation Sciences , Universiti Kebangsaan Malaysia has created a transliteration search engine that can change Romanised Malay into Jawi script. Vice Chancellor, Prof. Tan Sri Dato’ Dr. Sharifah Hapsah Syed Hasan Shahabudin said the transliteration engine named TERUJA can transliterate any Malay language website that use the romanised alphabets into Jawi without changing the structure of the website. Speaking at the 5th session of the 38th UKM convocation today, she said the faculty has succeeded in bringing a number of its researches for commercialisation . At today’s ceremony, the third day of the 38th convocation, 2066 graduands receive their respective Bachelors and Masters degrees. They are from the Faculty of Islamic Studies (FPI), Faculty of Information Science and Technology (FTSM), Institute of Islam Hadhari (Hadhari), Faculty of Allied Sciences (FSKB) and Faculty of Education (FPEND). For the first time this year FSKB also produce 20 undergraduate in forensic science with honours. At the convocation today Syakirah binti Edrus from the Faculty of Islamic Studies received her Tun Razak Award as best student. UKM today also awarded an Honorary Doctorate (Islamic Studies) to Prof. Tan Sri Dato’ Dr. Abdul Shukor Hj Husin (FPI) in recognition of his contribution in Islamic scholarship in Malaysia. Prof Tan Sri Dr Abdul Shukor is Chairman of the National Fatwa Council. He had once served as the Dean of FPI and later the Vice Chancellor of Universiti Sains Islam Malaysia (USIM). Former RTM Director of Music, Dato’ Johari Salleh was also conferred an Honorary PhD (Arts) for his contributions to the development of music in the country and in UKM. In her speech the Vice Chancellor said, efforts by the Faculty of Information Science and Technology has benefited the community especially those who are poor and in the rural areas. She cited the Mytuition project carried out to help slow and weak learners while also further improving the bright students. UKM was able to achieve them because it constantly make changes and take the best practices and applied them in its quest for excellence. As a result UKM has produced academics who are respected internationally and given the confidence to hold international conferences like the recent International Association for Organisational Innovation. Of the achievements, she said the Faculty of Islamic Studies is leading research in the fields of Dakwah, spirituality, Islamic developments, Reveal knowledge, Turath Islam, Religion and Islamic thought, culture, jurisprudence and Muamalat. 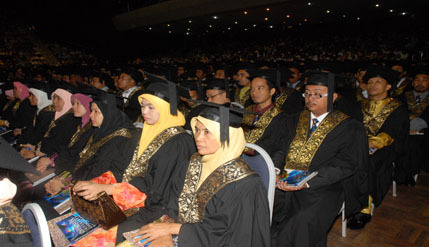 The faculty had in the last five years received RM10 million of research funds. Researchers from the Faculty of Education received significant recognition from the Prime Minister when the faculty was selected to implement the PERMATA Pintar programme for gifted children. “A PERMATA Pintar centre is being built in the UKM campus to be operational next January with grants from the government. The Faculty of Allied Sciences have carried out programmes aimed at giving new hopes to patients. “These include the Cochlear implant an intervention programme for children with hearing problem and the prosthetic leg labrotary which started its operation on 31st March 2010.